How Much Money Does 'Wolf of Wall Street' Jordan Belfort Owe To His Victims Today? 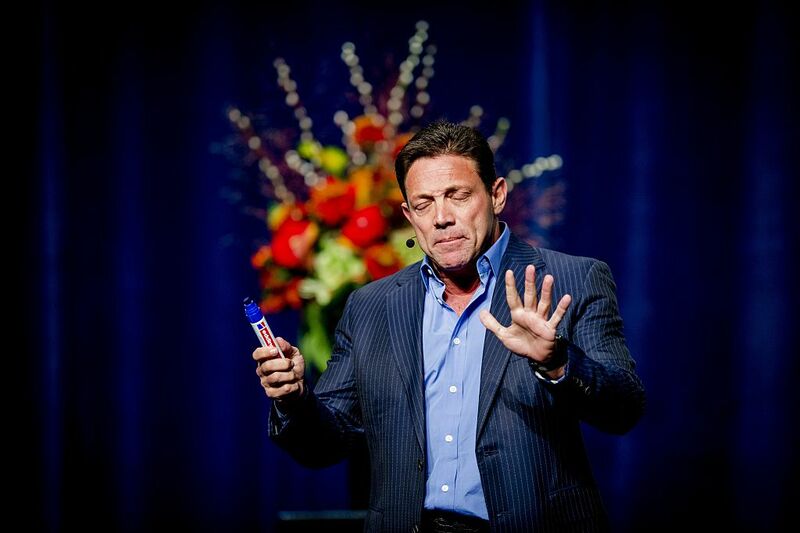 Jordan Belfort, aka the Wolf of Wall Street, defrauded his clients out of more than $200 million. He owes those victims $97.5 million but has only paid them less than $13 million in the 10 years since he got out of prison, despite the money he made for his memoir, the film adaptation of it, starring Leonardo DiCaprio, and the $9 million he earned from speaking engagements from 2013-2015. Belfort isn't just a con artist, he's a deadbeat. Now, prosecutors want him to pay up. A little background: Belfort ran a penny stock boiler room on Long Island called Stratton Oakmont, Inc. He made a fortune by using high pressure, deceptive tactics to sell penny stocks at inflated prices to people new to investing. After Belfort pumped the value up fraudulently, he would sell his shares before the prices crashed. As a result, he made a huge fortune in a short period of time and that put him on the radar of government watchdogs. He was arrested in 1999. He entered a guilty plea on charges of fraud and other crimes of stock market manipulation. He was convicted of defrauding 1,513 investors out of more than $200 million. In 2003, Belfort was sentenced to three and a half years in prison and ordered to chip away at the $110 million restitution by paying half of his future earnings to the government. Belfort was released from prison in April 2008. At a hearing in Brooklyn recently, U.S. District Judge Ann Donnelly said that Belfort must meet his obligations. She wants Belfort to be questioned by prosecutors about his income. At the time of the trial, Belfort was overseas at a speaking engagement. The issue is that Belfort's attorneys are trying to prove that income Belfort has received is not subject to garnishment. Prosecutors want to garnish Belfort's income. Between 2007 and 2009, Belfort paid just over $700,000 to his victims. In 2010, he paid nothing. He also paid $11 million at the time of his sentencing, mostly from the property he relinquished to U.S. Marshalls. Belfort's attorney is arguing that her client is cash-strapped. When the attorneys for the government found out about the publishing of Belfort's memoir in April 2007, they filed restraining orders against Bantam Books, Warner Brothers and Appian Way, a film production company founded by Leonardo DiCaprio. Eventually, Belfort agreed to pay 50% of his earnings from the film adaptation of his book to his victims. However, now prosecutors want to know why he hasn't paid into his restitution fund from the $9 million he made in motivational speaking engagements between 2013 and 2015. "For the record, I am not turning over 50 percent of the profits of the books and the movie, which was what the government had wanted me to do. Instead, I insisted on turning over 100 percent of the profits." Belfort has claimed a number of times that he has never profited from the book or the movie. He has also claimed that he has paid way more towards the restitution than he was required to do by the courts. As mentioned, to date, the victim's fund has received $12.8 million, $11 million of which was seized at the time of Belfort's arrest. He hasn't made a payment in years, yet continues to insist he's paid it all off. Jordan Belfort is still a conman. As part of the US government's previously established $110 million restitution order against Belfort, he will have to surrender all of the profits from his stake in Delos Living. If anyone would know how to identify the way people steal stolen money, it would be Belfort, who as the movie about him shows used his plundered gains to fund a lavish rockstar lifestyle.